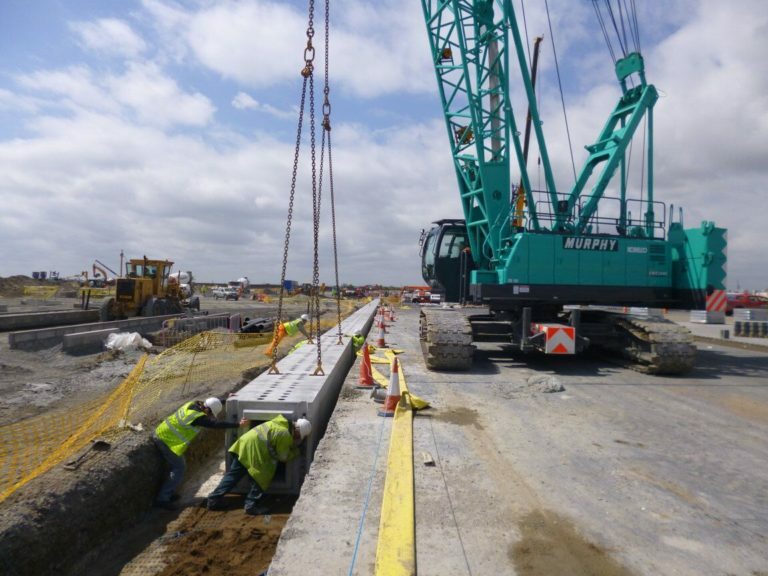 We were engaged by John Sisk and Son to work with Dragados and Initec to develop a bridge deck design to span the cooling outflow channel. The channel had a span of 16 metres and was over 90 metres long using a beam and slab deck comprising of TY9 beams. 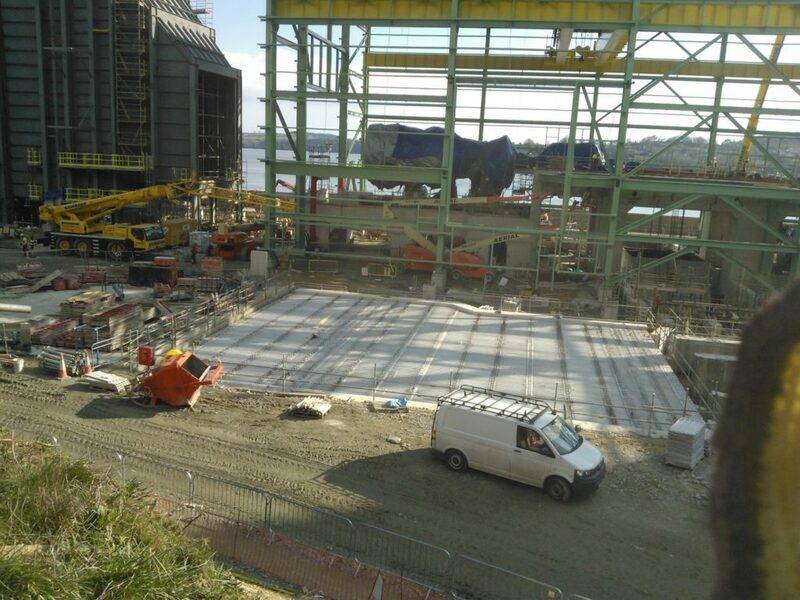 The deck slab was formed using Banagher Precast fibre reinforced permanent shutter spanning between beams to allow John Sisk and Son to pour deck slab on site. We also developed a unique installation system for the shutter which eliminated operatives working to a leading edge and halved the installation time. It was essential that the channel remain functioning while the construction of the deck was ongoing to enable the existing power plant to remain operational. This involved detailed planning to establish a safe working methodology which could allow work to continue on a watercourse which could turn from a benign stream to a raging torrent in a matter of seconds. 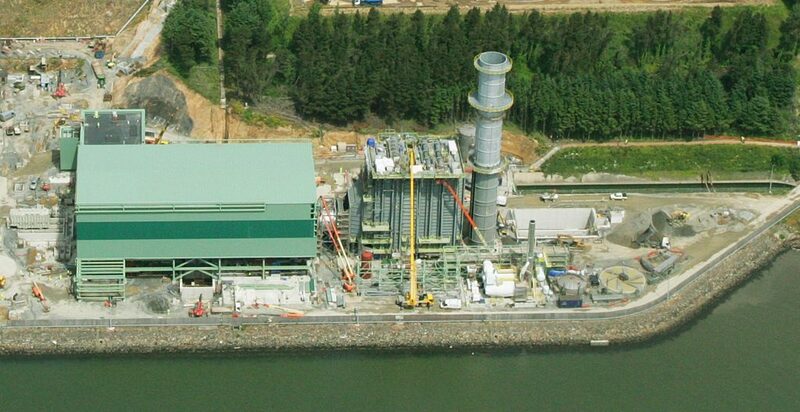 The structure was split into 4 sections with expansion joints and edge beams at the end of each section. 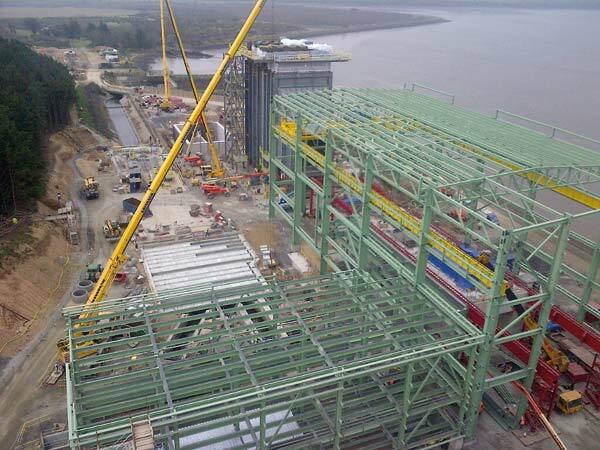 This allowed Banagher to introduce integrated safety features into the bridge beams with fixings for handrails cast into the units so the work area was effectively safe as soon as the units were placed. 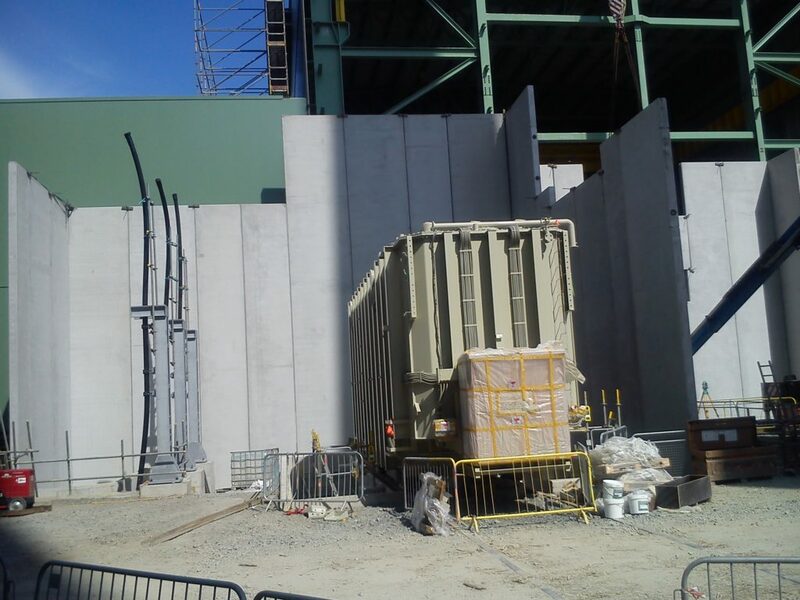 Upon successful completion of the bridge deck the design team requested a precast alternative to transformer blast walls which were a critical item on the construction programme. 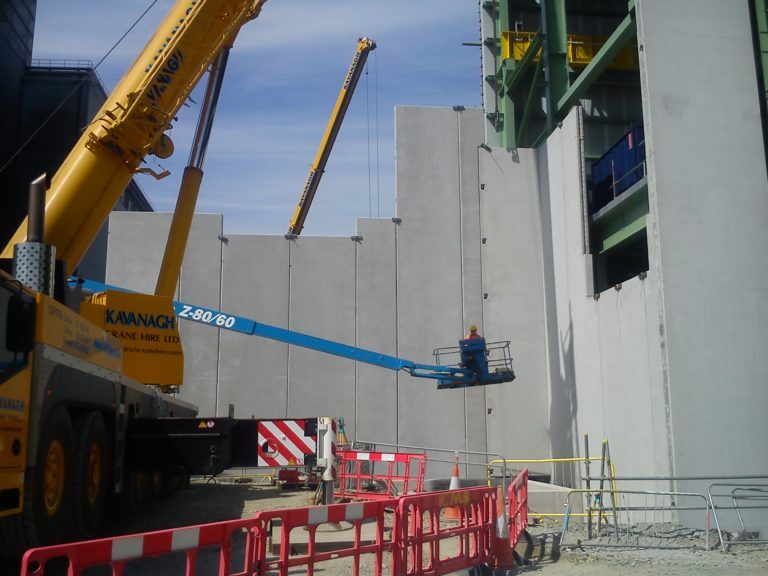 Having completed similar projects with John Sisk and Son on power plants in the UK we were able to offer a precast alternative to the cantilever blast walls which were over 16 metres high. The units were arranged in a complex geometrical formation with large designed openings in the wall. 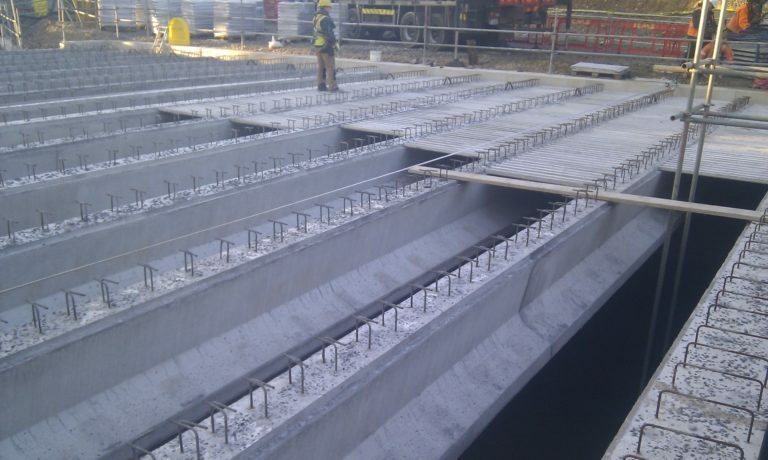 These complications were all overcome by our design team and by using our unique foundation connection the units were installed in rapid sequence without the need for temporary propping. 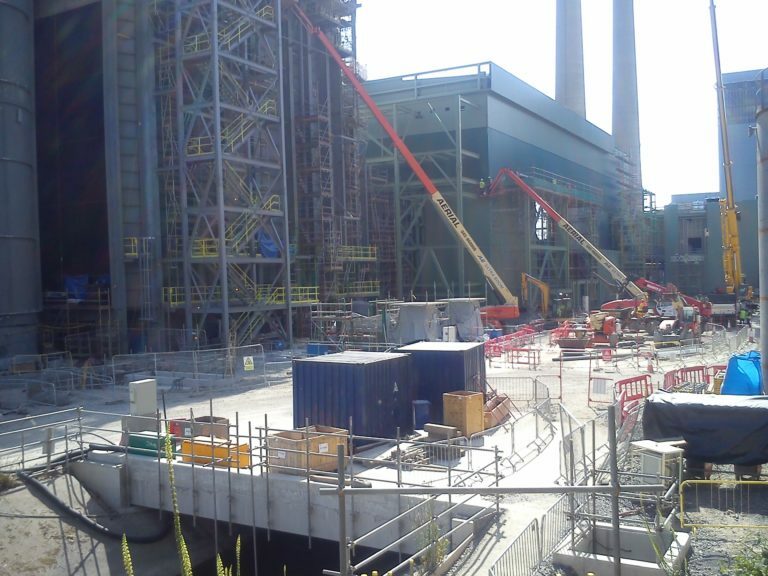 The units were installed in less than 2 weeks saving the client months off the original programme. Banagher Precast Concrete use BIM and 3D modelling to ensure complex structures such as these blast walls are designed and installed without encountering problems on site.